Top Notch Material: Family Finest Bake- N-Mold Cookies are Perfect for Holiday Celebrations! Family Finest Bake- N-Mold Cookies are Perfect for Holiday Celebrations! If you family bonds over food, or loves to create edible art together, Family Finest now offers this super cool Bake-N-Make Cookie decoration kit! I just know this is something my boys and I will enjoy together, but I have not been to a Walmart recently to pick our kit up! Each cookie decorating kit includes ingredients to make four extra large cookies, with four colors of icing and sprinkles. Baking and decorating cookies has never been so fun or tasty! Find our kid friendly cookie kits in the Dairy Aisle at your local Walmart store. 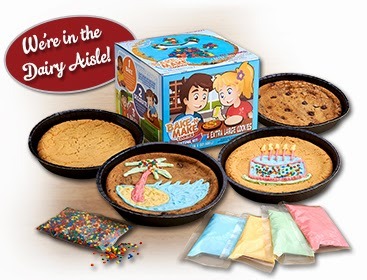 Family Finest Bake-N-Make Cookie Decorating Kits are perfect for: after school snacks, Friday night family parties, birthday parties, sleepovers, holiday get-togethers or anytime ... because nothing says love like fresh baked cookies! The kit comes with 4 extra large cookies plus frosting and sprinkles, and we know ALLLLL kids just love sprinkles. This is perfect for the holidays, and I know my boys and I will enjoy decorating super cute holiday themed cookies! I know my boys favorite part will be eating the yummies that THEY created!! Oh my kids would love these baking kits, they always love helping me bake cookies and desserts, so this is perfect for my little bakers.